13 Dec No Need to Feel Cold at Your Winter Wedding! 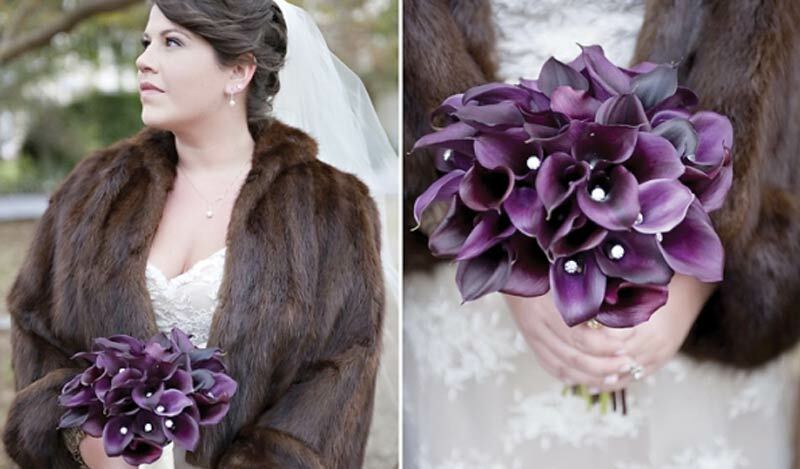 Winter weddings are a fabulous choice, especially for couples who love the icy beauty of the season. Does that mean you have to endure the cold weather in a dress that doesn’t provide you with much cover-up? Definitely no! And definitely not with the latest trends and ideas out there! How to accessorize your wedding dress in a way that will make you look really beautiful and still keep you warm? Here are some fantastic ideas you could use for your own inspiration! Wear a leather jacket. Who said brides can’t wear their leather (or, well, faux leather)? It actually looks amazing, especially with the boho-chic and even with tea-length dresses! Also, you can wear your leather jacket in white or black, as you please. Faux fur jacket. If you want to achieve that hard to mistake timelessly elegant Golden Age Hollywood look, the best way to do this is by wearing a (quality!) faux fur jacket. There’s something quite Marilyn Monroe-esque about this look, isn’t there? Fur (or faux fur) wrap. Elegant and modern, timeless and contemporary, beautifully stylish and yet so simple, an oversized faux fur wrap can totally change the entire appeal of a wedding dress – not to mention make you feel a lot warmer during a cool winter wedding day! Capes and capelets. Probably the biggest trend in this niche, capes and capelets are a real fashion statement for brides who want to feel as if they’ve just danced their way out of a fairytale. White or colored, these accessories are, indeed, true beauties! Have you found the perfect wedding venue? If not, remember to come and see what The Oaks can offer! Our stunning waterfront wedding venue will make you and your guests feel truly amazing!